From London's West End - Richard Armitage stars in Arthur Miller’s classic American drama, based on Salem’s infamous witch trials, brought vividly to life in this visceral new production by internationally acclaimed director Yaël Farber. In a small tight-knit community in Salem, Massachusetts, personal grievances collide with lust and superstition, fuelling widespread hysteria. Miller’s timeless parable attacks the evils of mindless persecution and the terrifying power of false accusations. Richard Armitage’s film and TV credits include The Hobbit trilogy, Into the Storm, Captain America: The First Avenger and Spooks. Theatre includes The Duchess of Malfi and Macbeth for RSC. Yaël Farber is a multiple award-winning director and playwright. Her production of Mies Julie won a string of international awards at the 2012 Edinburgh Festival, was named one of the Top Ten Productions of 2012 by The New York Times, and Top Five Productions of 2012 by The Guardian. Arthur Miller is one of America’s greatest playwrights. His many plays include All My Sons, Death of a Salesman and A View from the Bridge. 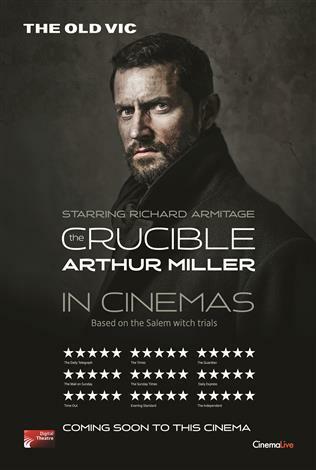 The Crucible was captured live at The Old Vic, London during its 2014 season.